Hello guys, this is the first version of the new exercise weapons script! - You will change enable="0" to "1". - Go to the function function Player::onMoveItem added this lines in the top. - Go to the function function Player::onTradeRequest added this lines in the top. Haven't tested it yet on the server I'm working on, but looks good. - Go to the function function Player nMoveItem added this lines in the top. - Go to the function function Player nTradeRequest added this lines in the top. Wow.. this is looking great! Keep up the good work! Think about "early exit" in functions. There are more readable in that way. Now I can't edit this post .. but your suggestion is pretty excellent! Share your update code ? please ! Nice! Gonna test it out for sure. Just tested it out and I was wondering if it's supposed to give 1 level on each attack? 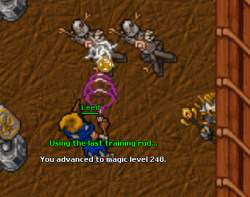 That seems a bit OP would it be possible to make it a bit more like rl tibia that every attack is like you wasted aprox 610 mana? Are you inside a PZ? I get this message when I am not in PZ and testing it. witch tfs do you use ? How can I make it attack many times? You mean it shoots once? Because it is it set to keep shooting using attackspeed. The only problem is if you hotkey it you can mass shoot the full wand in no time at all. What if I wanted to do it as if it were a wand?